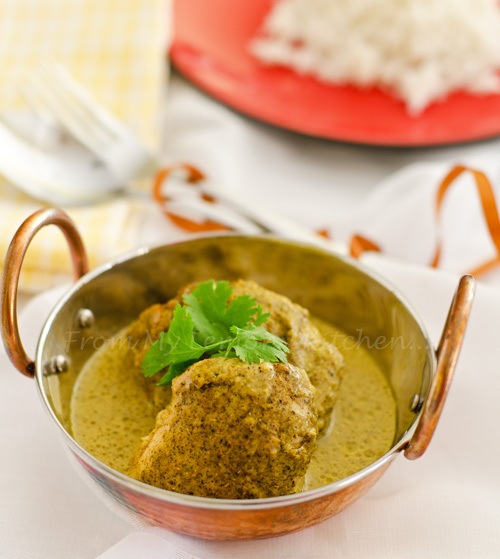 Indian cuisine has lots of flavour with every bite... with wonderful aromatic spices like cumin, black pepper,coriander, cardamon as well as the use of fresh tumeric, ginger, coriander and mint. Among those wonderful spices...my favourite spices are coriander seeds and cumin, and I have them in big bottles...stock up in my pantry. what's your favourite spice/s...? Going down memory lane... when I was in my teens and my sisters left home to either work or start their family, and I was the only 'girl' left in the house to help my mom in her kitchen... boys were spared and barred from the kitchen... dont ask me why!! I haven't a clue till today mom would asked me to prepare spices for her...either cumin or coriander. Heat about 2 tablespoon of oil in the frying pan, brown the chicken to seal the juice. Remove and place the chicken in a casserole dish and set aside. In another frying pan, roast then grind poppy seeds and almonds. Place the grounded almond and poppy seeds into a blender together with Greek Yoghurt, golden fried shallots, Hara Masala, Garam Masala and 200ml water. Blend into a smooth paste. Reuse the oil (chicken earlier) and reheat in the same dish with a dollop of butter. Add the Four Spice and grounded coriander and fry until fragrant. Pour in the blended yoghurt spice and the remaining 200ml water, leave it for 5 minutes until the mixture is heated through. I am drooling looking at these beautiful and delicious photos! I can even smell the aroma of the chicken here...:)!! 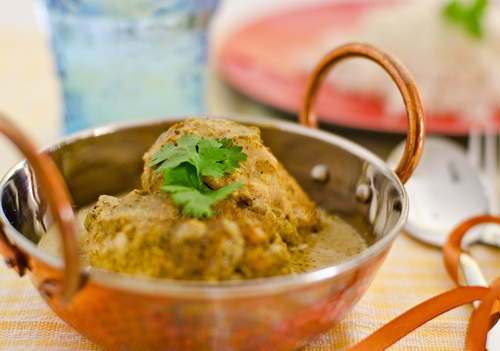 Indian cuisine definitely wins for most flavorful both in taste and aroma! Cumin is one of my favorite spices too along with cinnamon and turmeric. yum! this looks fantastic! and a much healthier alternative cooking with yogurt as I only always use coconut milk of whipping cream to thicken the gravy. thanks for sharing the recipes. Stunning photos by the way! Growing up, I remember eating the best curry that was made by aunty from Kedah. Infact the best curry in the family always come from and made by the saudara-mara dari Utara. They are more authentic than our Selangor curry. Not sure why, but I love their curry. Talking about Kedah, I think I saw your Sultan and his wife in Carousel, Cannington today. Selamba derk saja dia jalan. OMG... you are spot on!! He must be very2 old now... the last time.. I saw him in person was in 2004... he was visiting my uncle in hospital kat KL. Surprisingly he still looks the same. I think his younger brother Raja Muda Kedah looks older than him. Oh, these look so wonderful! Would go so nicely with a basmati rice! Love the spices you are using here....yum!